"I named this set after the album that I was listening to when I created it, Candy Apple Grey" by Hüsker Dü. A pretty cool record... but anyhoo... 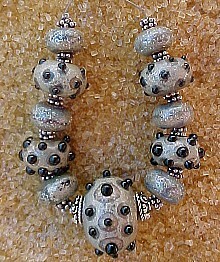 This is a set of 11 beads, decorated with seared fine silver, ivory and black dots and accompanied by bali silver bead caps and spacers. I have to say that the picture can't capture their sheen and iridescence. Created from Moretti and Czech glass and fully annealed."